Tuffentertainment - Zombie Mud Run! Competition wave winner will receive an Official TUFF Zombie Bug out Bag! To be able to participate as a runner or zombie, you have to be 14 years of age or older. For those not running in the race, you may attend as a spectator for FREE! No weapons or mock weapons will be permitted on the premises. No drugs, outside alcohol, or outside food/beverages are permitted on the property. Approved beverages include one factory-sealed water bottle, up to 1 liter in size. No alcoholic beverages are to be consumed by people under the age of 21. Their will be a race for the Kids ages 13 and under at 12:30 on Sat the 5th and 11:30 Sun the 6th. Price is $10.oo per child and payable the day of the event. Waiting for you in the Safe Zone is the Undead Festival, a celebration of all things zombie. From when gates open till 5pm, there will be music, games, zombie/people watching, dance parties, and much more for your entertainment. In addition to great food and beverage, there will be unique vendors and TUFF Entertainment merchandise for you to check out! *Undead Festival run time will vary by location. If being chased by zombies isn’t enough, we will have a series of man-made and natural obstacles waiting for you throughout the course. Jump, slide, and climb your way through our challenging course, all while zombies are hot on your tail. Test your strength, speed, and wit as you battle your way to our Extraction point to be evacuated from the infected area. Make it through this last obstacle, and you are finally in the Safe Zone! Many Evacuation Times are almost sold out! Register now below! 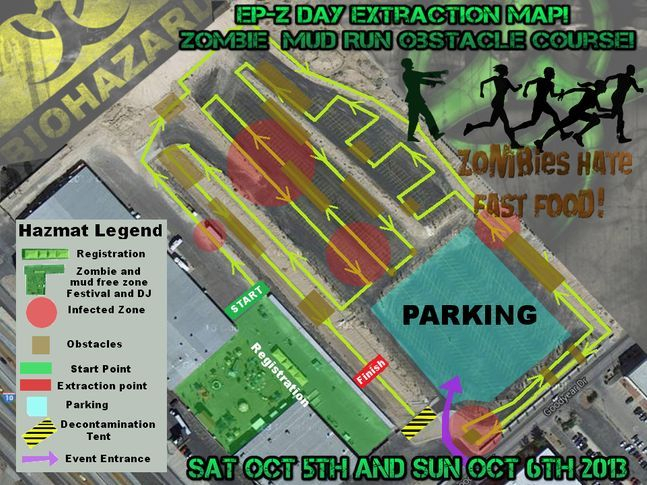 Sign up as a Zombie or Volunteer to help out and run for Free! there will be a wave set up each day just for Volunteers and Zombies For more details go to The Vendors and Volunteers page!